Discussion: Darcy's Dad, Tim, comments on the anniversary of the 1948 Comic Book Scare, and that leads to a discussion about changes bringing up some people's fear of the future, the speed of change and how technology seems to be increasing that eternally rapid pace. 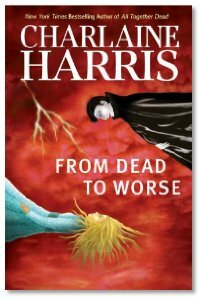 Interview: Michael, Lorrie and Michael welcome Charlaine Harris to the studio, to discuss the newest in her Sookie Stackhouse series, From Dead to Worse. Lorrie has become newly addicted to the series, and Charlaine tells us about creating a world that melds real people with supernatural beings and abilities so smoothly. We also hear a little about the upcoming HBO series based on the books, "True Blood", and the excitement about the cast and filming is high. The series will start on Sunday, September 7, starring Anna Paquin as Sookie, and in the hands of Alan Ball, we're in for a great show.